Spektrum DX8. 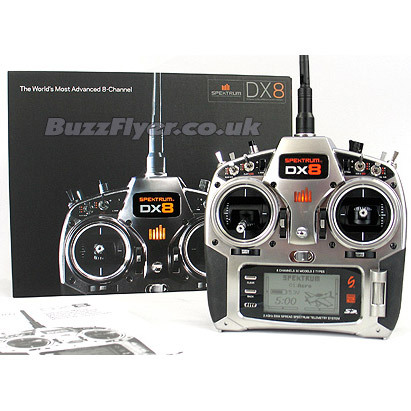 Spektrum innovation gives RC pilots a new level of security and ease-of-use with the DX8. In addition to providing the benefits of Spektrum’s patent-pending DSM2 technology, the DX8 introduces advances in software, telemetry and ergonomics you simply won’t find in any other 8-channel system. The DX8 is Spektrum’s first aircraft system that incorporates integrated telemetry. The transmitter’s screen displays real-time telemetry including receiver battery voltage, flight log data and signal quality. External sensors allow rpm, external voltage and temperature to be displayed on screen in real time. Alarms can be programmed to warn of low battery, over temperature, exceeded rpm and diminished RF signal strength. The DX8 offers sophisticated programming to meet the demands of even the most experienced airplane and helicopter pilots. An easy-to-use rolling selector combined with intuitive software makes setting up models quick and easy. The DX8 is SD-card compatible allowing an infinite number of models to be stored and transferred. Plus firmware updates can be downloaded from the web providing you with the latest software upgrades at the click of a mouse. Great product, easy to navigate and program, good ergonomics and switch layout. Easy to switch between modes, good support all around the globe and very commonly used. I added the TM1000 telemetry module with temperature sensor (on my ESC), voltage on the main battery back and brushless RPM sensor and they all work great. Please bear in mind that you're buying the Transmitter only, NO receiver and NO telemetry module included! The pictures in the product descriptions are misleading!